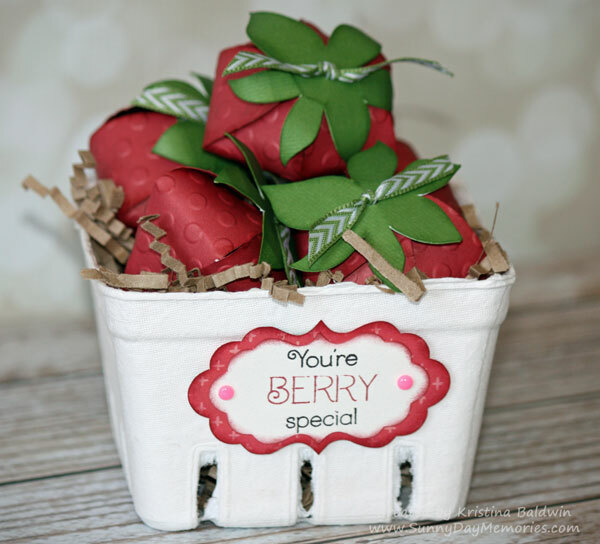 Creating a darling basket full of strawberries seemed only natural when CTMH released it’s special Taste of Summer Paper Packet and Taste of Summer Stamp Set in honor of National Scrapbooking Month. Plus, I found these cute berry baskets at Michaels that would work perfectly for holding the fun 3-dimensional paper strawberries. Cutting the strawberries out using my Cricut machine and Close To My Heart’s Cricut Artiste cartridge was a snap! 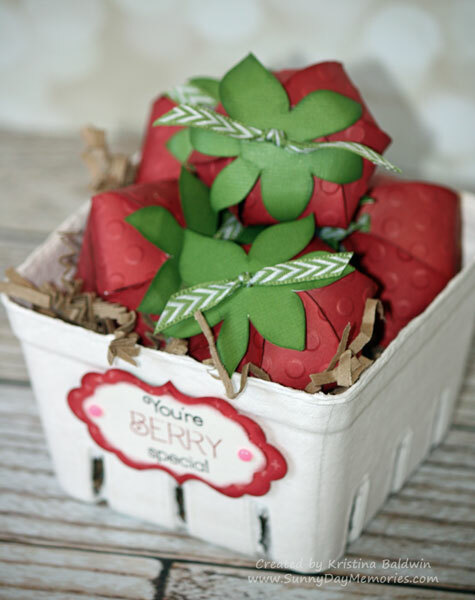 I used Ruby Cardstock for the strawberries and cut them out at the suggested 6″ size. The leaves were cut with Topiary Cardstock and because Close To My Heart’s Cricut cartridge images are linked, I didn’t need to adjust the leaf size once I plugged in the size for the strawberry! To add depth and texture I embossed the strawberries using the Dot Embossing Folder and then sponged the edges with the coordinating ink pad and sponge dauber. 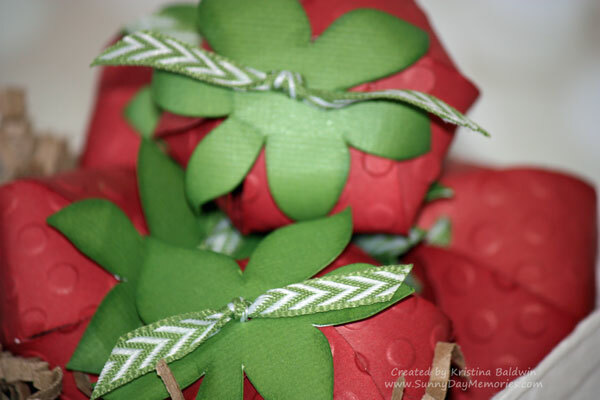 To complete them, I simply weaved the Topiary Mini Chevron Ribbon through the holes in the strawberry, following the same pattern to keep the shape uniform, and then up through the hole in the leaf and tied the ribbon in a simple knot. An additional touch you can try with your strawberry leaves/stem to achieve a more realistic, 3-D look is to curl your leaves using your Bone Folder. This technique is similar to the concept of curling ribbon. Simply rub the bottom side of your leaves with the edge of your Bone Folder until you get the desired curled appearance you are trying to achieve. You can do this before you put the strawberry together (a little easier) or once you’ve got the strawberry all tied together. Still using the CTMH’s Cricut Artiste cartridge, I cut out the frames–once with the Taste of Summer Paper and once in White Daisy Cardstock to stamp the “You’re Berry Sweet” sentiment from the Taste of Summer Stamp Set. For the 2 colors, you’ll want to mask the sentiment and stamp it twice…once in Black ink and once in Ruby. I just created this project at my Stamping on Saturday Class this past weekend and will be doing it with my monthly Stamp Club, too! It’s a super cute project that takes hardly any time to create. I’ve made these Cricut Strawberries before – you can see another version of the strawberry with different texturing on my Cricut page. Need some supplies to create your own? Shop my ONLINE STORE. 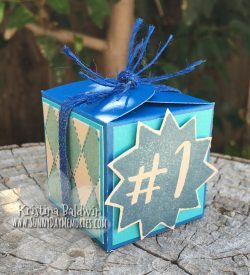 This entry was posted in 3D item, CTMH Cricut Projects, CTMH Specials and tagged Close To My Heart specials, Cricut Artiste, National Scrapbooking Month, stamp club. Bookmark the permalink.